Samantha, my 13 month old Labrador retriever has an inflamed eye that weeps and the other eye has a lump near the tear duct. I took her to the vet and he didn't know what the lump was, but he gave me some antibiotics and some eye ointment. She finished both and developed a dry cough the after the treatment finished, which lasted for 3 to 4 days. She seems fine as usual in her behaviour. She has kibble in the morning and kangaroo meat at night with a few dry treats during the day and some bones every second day or so. She drinks alkalized water. She gets plenty of exercise every day and gets lots of affection. I’m afraid I can’t tell exactly what is going on with your dog’s eyes based on your description and picture. If the lump near the tear duct isn’t bothering her and that eye is otherwise normal, I think you should concentrate on her inflamed eye first. I’m not sure whether this is a new problem for her or something she has had to deal with for most of her life, and that does make a difference as to what conditions are most likely in her case. Possibilities include an eyelid abnormality (e.g., entropion where the eyelid rolls inward and rubs against the surface of the eye), a wound to the surface of the eye, a foreign body (e.g., a piece of grass) lodged under her third eyelid, poor tear production, infection within the eye (not just on its surface),and more. Let your veterinarian know that the antibiotic ointment has not cleared up your dog’s eye inflammation and discharge. He or she may want to run some more tests based on that information, or perhaps refer you to a veterinary ophthalmologist. If you want to treat the eye problem naturally if the anti biotics havent worked you could bathe the eye with a mix of cornflower water and sandalwood essential oil. 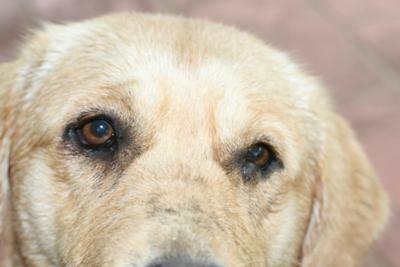 Both are often selected by dogs with eye problems ranging from infection, inflammation. Sandalwood is a natural antibiotic and works especially well on the upper respiratory tract. I have a cocker spaniel who often gets ears and eye problems and bathing the eye with the above combination works a treat.